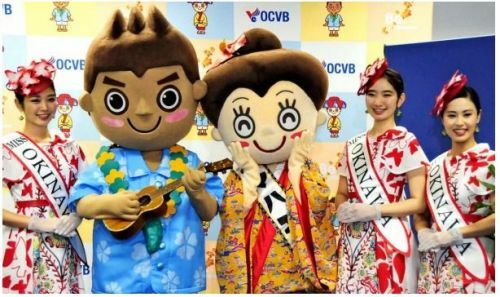 On April 10 Maharo-kun (left) and Mahae-chan make an appearance at the Okinawa Industry Support Center, exemplifying their determination to promote tourism to Okinawa. On April 10, the Okinawa Convention and Visitors Bureau (OCVB) unveiled Maharo-kun as a new mascot. Serving as a promotional ambassador for Okinawa together with Hanagasa Mahae-chan and the three Miss Okinawa beauty queens, he will work to draw domestic and foreign attention to the local charm of Okinawa as a tourist destination. Maharo-kun’s backstory starts on Oahu Island in Hawaii. He is a third-generation Okinawan as his grandmother is from Okinawa, but he is from Honolulu. His first visit to Okinawa was to attend the 6th Worldwide Uchnanchu Festival. Maharo-kun says he has decided to move to Okinawa with the thought of becoming a bridge between Okinawa and the rest of the world, but it is clear the real reason is because he fell in love with Mahae-chan at first sight when he met her at the festival. To pass the time Maharo-kun likes to surf, play ukulele, and practice karate. On the same day that he was introduced, he held an audience at the Okinawa Industry Support Center where he also demonstrated his ukulele and karate skills.